Posted on November 01, 2014 at 10:00:31 am by Holley T.
One of the most unique shows is coming to Fort Wayne&apos;s Historic Embassy Theatre this season. 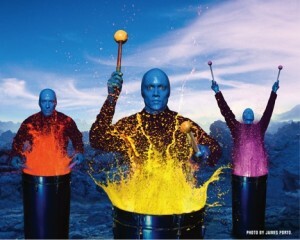 The Blue Man Group will hit the stage on November 13 and 14. It may seem surprising that a show with no speaking can be so involving, but it really is something to be experienced. I&apos;m sure you&apos;ve heard all the buzz about this show, but having experienced the show myself, I have to say, it&apos;s all true. I was less than jazzed about seeing the group perform as part of our class trip, but it became the highlight of the trip. The Blue Man Group&apos;s percussion skills are unmatched. Their command of sound and rhythm was impeccable and enough to make even the most avid musicians sit up and take notice. Not only do they use traditional drums to hammer out amazing tunes, but they also use a variety of impromptu gadgets to create beautiful music. Pipes and household items turn into valued instruments. And if their skill wasn&apos;t impressive enough, they throw paint and water into the mix and create beautiful works of art. If you are looking at the Blue Man Group Website or even reviews on other sites, they can seem a bit unhelpful. Most of say that the show is something to experience and all rave about the quality and variety. From someone who has seen the show, I can tell you that is true. It is a hard performance to evaluate or describe, but it is well worth a look. The show is great for people of all ages, and if you are looking for a little extra fun, try to get a seat in the poncho section. You may find yourself looking like a work of art when the show is over. And, you can register here to WIN TICKETS!